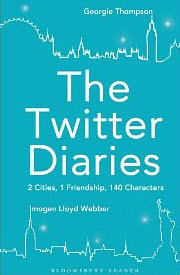 The Twitter Diaries by Imogen Lloyd Webber, Georgie Thompson. Publication : May 21st 2012 by Bloomsbury Reader. The Twitter Diaries tells the story of pen pals for the 21st century. Two parallel lives separated by an ocean but united over a social network. Tuesday (@Tuesday Fields), a sports reporter and Stella (@StellaCavill), a men's shoe designer, are Brit 30-somethings who are introduced in NYC on NYE by a mutual friend, a notorious transatlantic TV presenter. They strike up an instant bond. The Twitter Diaries is an instantly recognisable yet fictitious tale all generations can relate to, whether they are one of the world's 140 million and counting transfixed Twitter users or not. Accessible, funny and heart-warming, it's this summer's must read. Twitter Diaries revolves around the friendship between Stella and Tuesday, who get introduced to each other at a New Year's Eve Party. Over the course of the next year, they bond over twitter sharing their thoughts and stories about pretty much everything. For the most part, I guess this was a decent read but just not as good as I wanted it to be. I knew going in that this was more of a feel-good novel and didn't expect anything big/deep from it but this isn't the first book I've read that (supposedly) takes place on twitter and I loved Goodnight Tweetheart so I honestly thought I'd enjoy this one as well. The first thing that bugged me was that for a book that's called The Twitter Diaries, not a whole lot of tweeting takes place .The beauty/ugly thing about twitter that the tweets are mostly public but most of this novel takes place through DMs. So yeah, although the author stuck to the character limit, I didn't really get much of a twitter feel. Don't get me wrong, like most fluffy books this one's a quick and light read, perfect to kill a few hours but that's all it is. The writing's simple, relatable and suits this decade, where social media rules the world. BANDARQQ - Hi there, I do believe your web site may be having internet browser compatibility issues. BANDARQ - Greetings! This is my first visit to your blog!